We recently purchased the Articles of Association of an Association ‘for the mutual preservation of property and the more effectual prosecution and bringing to justice of house-breakers, horse stealers and thieves of every kind’ (Accession A13635 (D/DU 2835)). This early form of insurance/neighbourhood watch scheme was formed by the inhabitants of Great Oakley and surrounding parishes on 4 February 1794. 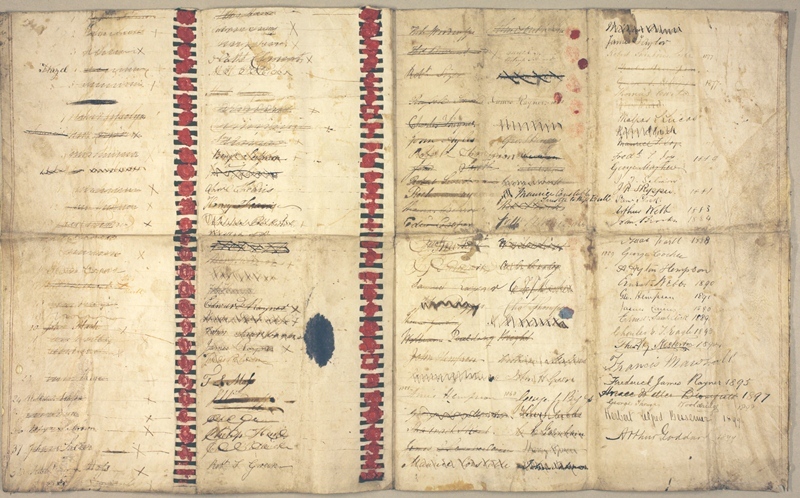 The deed is signed by all the members, including new members to 1899. In the days before any police force, local associations of this kind were felt necessary, particularly in times of war or trouble. This Association dates from the period of the Napoleonic wars which gave rise to a general fear of revolution and invasion. The parishes are in the neighbourhood of Harwich where many men would be stationed in the Martello tower and as militia organised to defend the county from attack by the French. Perhaps the members of the Association had experienced thefts from deserters or militia men trying to head home. It is surprising that the Association was still considered necessary at the end of the 19th century, long after the formation of the county police force in 1840.